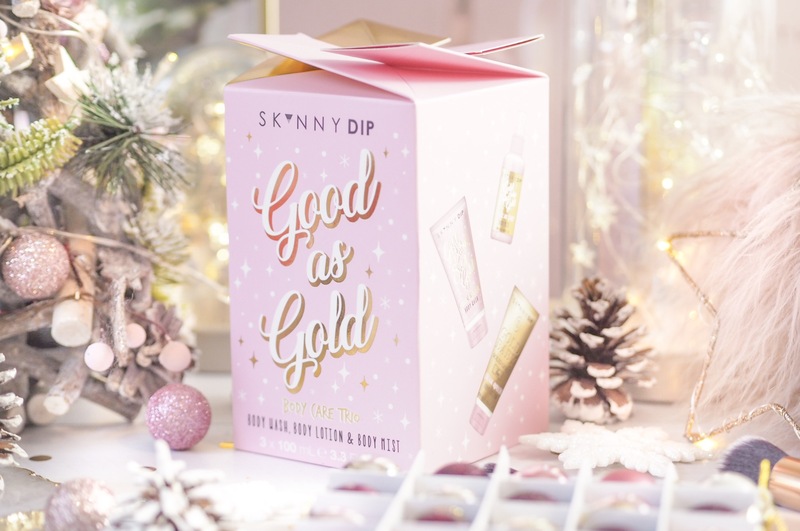 A stand out range this year is from Skinnydip – the packaging called to my inner girlie girl with a cool and sophisticated edge. It looks gorgeous and not too young – or old. But perfect for the teenagers, the millennial – and anyone else who loves cute and kitsch gifts. 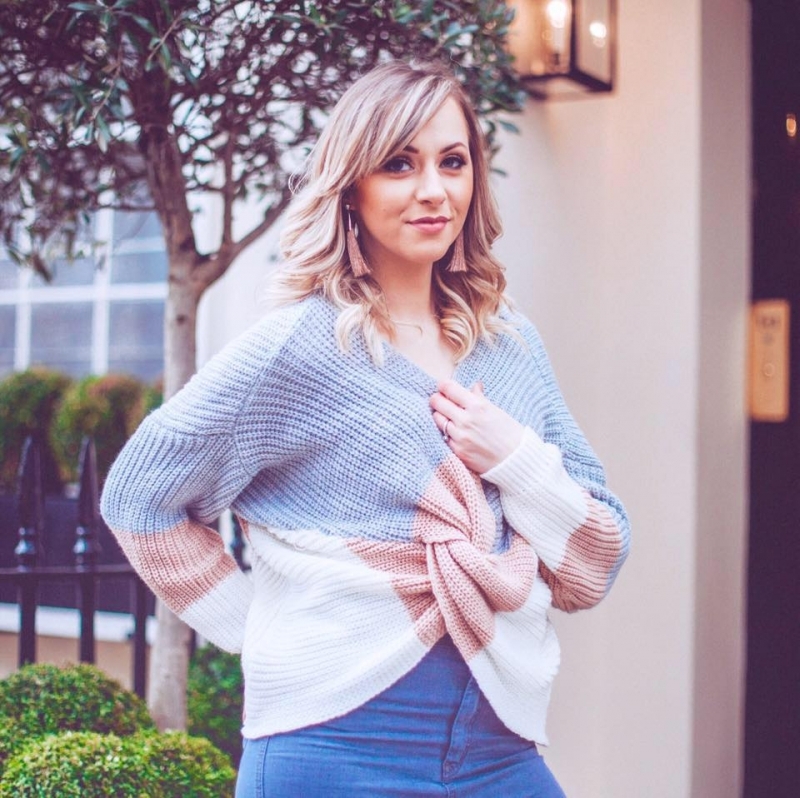 But not only does each item in the range look good, but the prices mean it’s great for Secret Santa, stocking fillers and under-the-tree gifts. Starting with the Stocking Fillers, there’s so many to pick from! But I’ll start with the I’m The Bomb Bath Fizzer Set. This gorgeous gold bath bomb comes like a piece of honeycomb that you break off and pop in the bath for a scented and shimmery bath time. 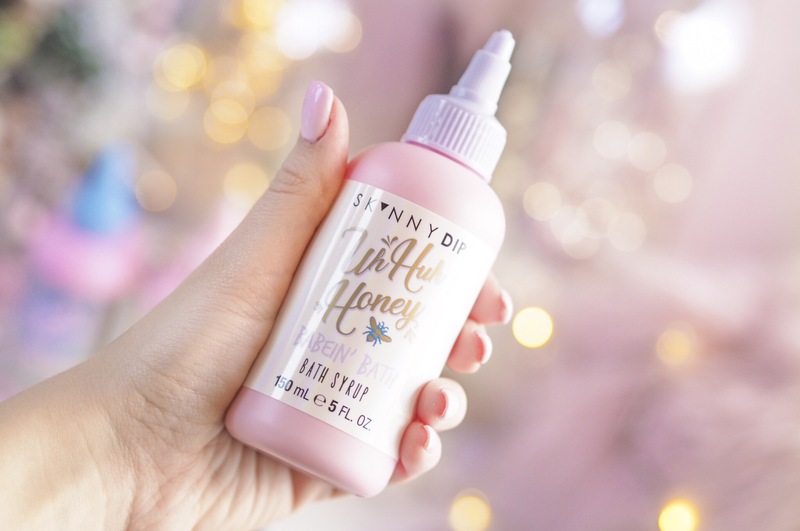 Naturally, the sassy-pants at Skinnydip also wrote on the packaging ‘Uh Huh Honey’ to match the theme – a sentiment not lost on me! This smells lovely and it’s only £6 – nifty right? 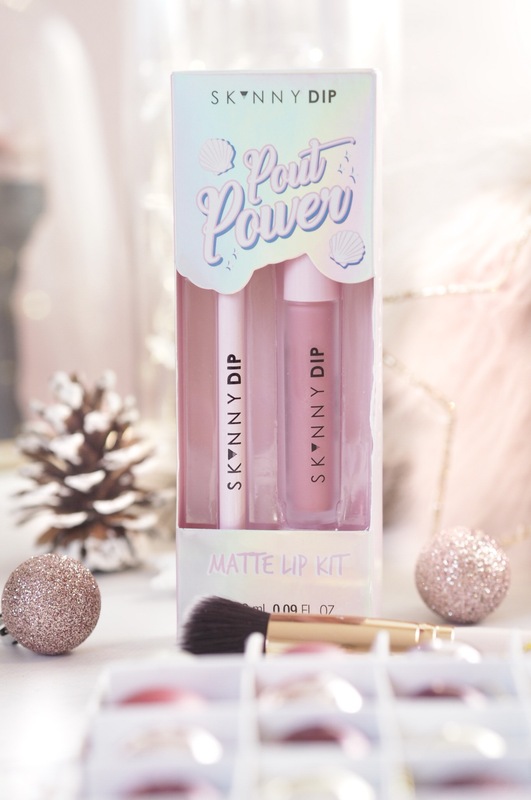 Next up, I was really excited to see some make up in their collection of gifts this year and their Power Pout Lip Kits are gorgeous and such great value at £8.50 each. Lip Kits are all the rage in the lip stakes because you don’t need to guess around for a perfectly matching lip liner and lipstick, they just come together and make things much easier. Plus, for those of us who religiously line our lips, this is so handy. There are three colours to pick from: Solid gold, Huh Honey and Shell Yeah. The lipstick is a matte with full coverage and a light texture, and the liner is a pencil with a rich payoff. I was surprisingly impressed with these and how well they performed! I have to say that my personal favourite of the Skinnydip Stocking fillers is the Bubble Trouble Bath Soak. I had one similar last year and was so gutted when it ran out! This year’s variety is even prettier and looks just as kitsch in an American milk-style carton. Also only £8.50, it’s a rich and gorgeous smelling bubble bath – it’s got a fruity but relaxing scent to it and I intend to get a few more of these before Christmas to stock up on before they sell out! You can’t beat a good bubble bath. 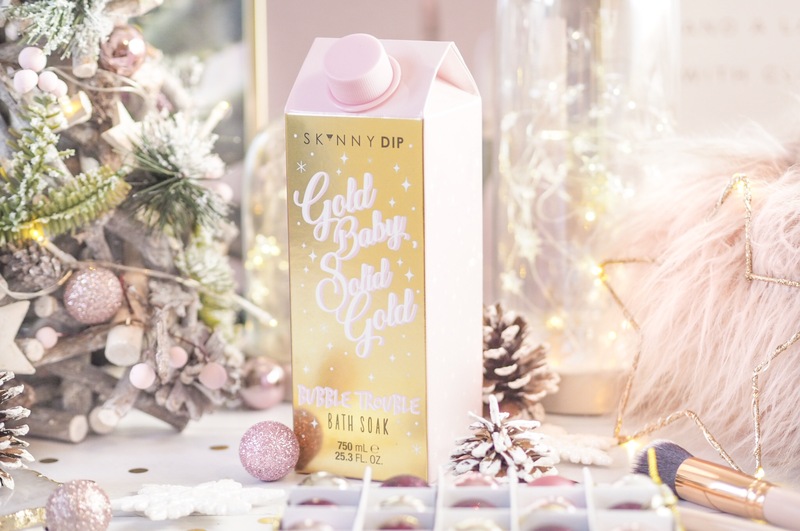 This year Skinnydip have spoiled us with their Gift Sets – there are so many amazing ones to choose from. The Spritz Me Baby Body Mist Trio is a great one and so versatile because who doesn’t love a good body mist? This set has three different scents for only £10 and each is 100ml – so it’s great value. The names are the same as the Lip Kits: Solid gold, Huh Honey and Shell Yeah and they all smell sweet and feminine and they’re the perfect handbag size as well. And I love the box and designs, I’d love to find this under my tree or in my stocking. Another gorgeous Gift Set this year, and also priced at only £10 (see, I told you how well priced the Skinnydip gifts were!) is the Good As Gold Body Care Trio. Packaged in a lovely gift box, you wouldn’t even need to wrap this one if you didn’t want to! This one has Body Lotion, Body Wash and a Body Mist in a yummy raspberry fragrance and the theme of the packaging is gold – so it looks great, smells yummy and has practical products included. This one is a no-brainer for gift shopping. The Big Squeeze Bath Syrup Trio is another gorgeous little set and his one is £12.50 for three of the Skinnydip bath Syrups. In the three themes, there’s one of each: Solid gold, Huh Honey and Shell Yeah. These look so retro and cool, and perfect for popping in the bath and the scents are tropical, sweet raspberry and honey-scented: so a great mix of scent varieties, no matter whether you’re a floral or musky kinda gal. A very practical gift set is the Shells Angels Hand Wash & Hand Cream set which is also £12.50. 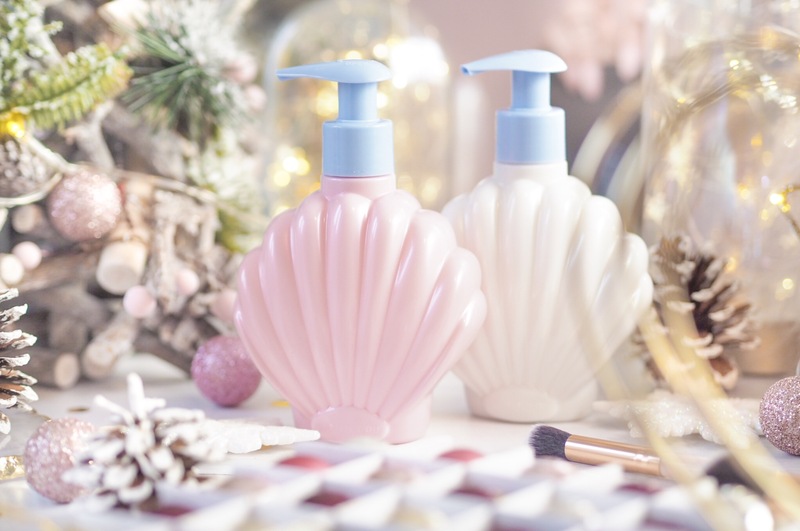 The duo features shell shaped bottles containing matching Hand Wash and Hand cream and they’re refillable too so they last longer than one use. One pink and one white they’ll look pretty around and hand basin this Christmas. When it comes to talking about whole products ranges, I always like to finish with a blow-the-budget option. 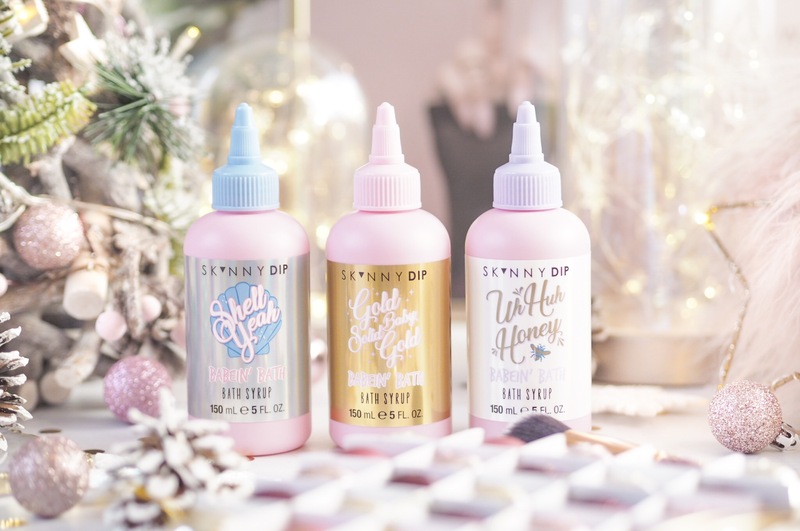 But the whole collection from Skinnydip is such good value and super affordable that there’s no ‘top price’ gift. There is a ‘top level’ gift set and it’s an absolute keeper, but even that won’t break the bank at £18! The I Want It All Bath & Body Kit features a Body Wash, a Body Lotion, a Body Polish, a Body Mist and a Bath Soak! So it’s a really comprehensive set featuring everything you need for squeaky clean bath and shower times and they all smell yummy. I love the packaging on this one and any girly girl would love it too! Okay, I was seriously excited when I saw this collection had make up goodies! 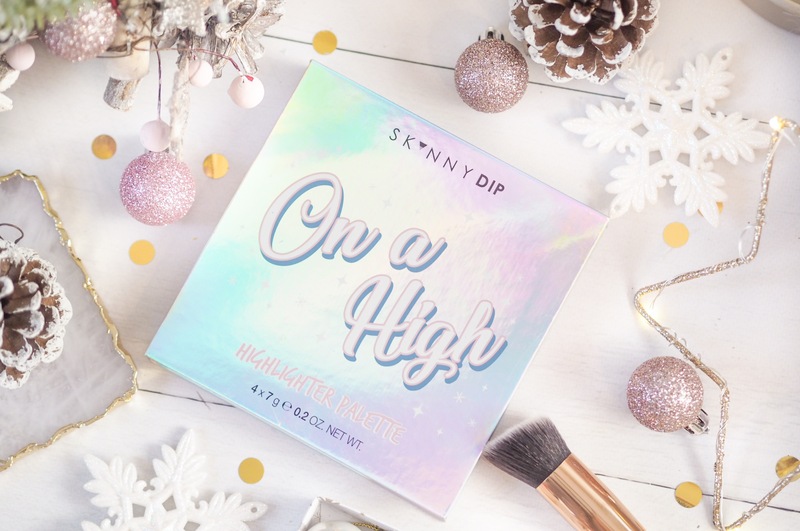 The Lip Kits weren’t enough and Skinnydip have PALETTES in their Christmas range – and it’s all still included in the Boots 3-for-2 Gift Selection as well. 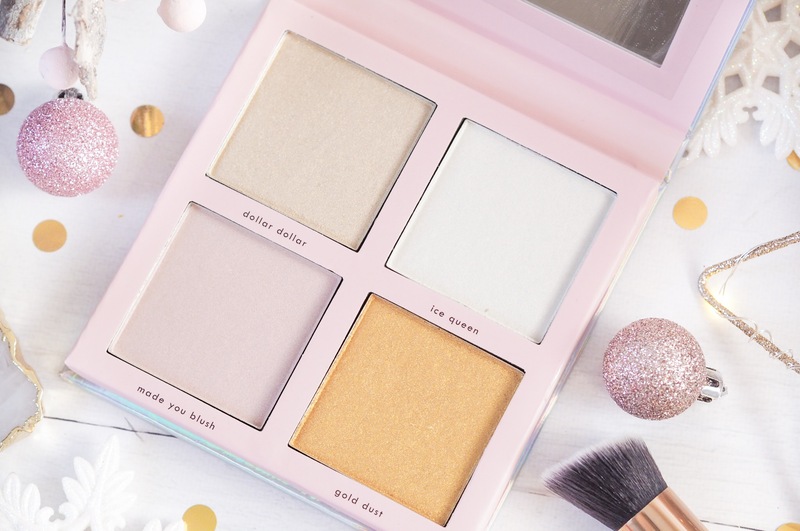 The first palette is a highlight palette called On A High and it’s actually a gorgeous selection of four shades. I was expecting more of a galactic shade range, which are gorgeous but not always the best for every day, but these shades are really wearable and versatile too! There’s a burnt pink tone for the blush and a more tanned bronze for the contour as well as two lovely and natural looking tones for the cheekbones/brow bone etc. The pigmentation is really lovely too and the payoff is lovely – I was surprised with just how lovely these were too! And it’s only £14 so it’s a great addition to make up collections. 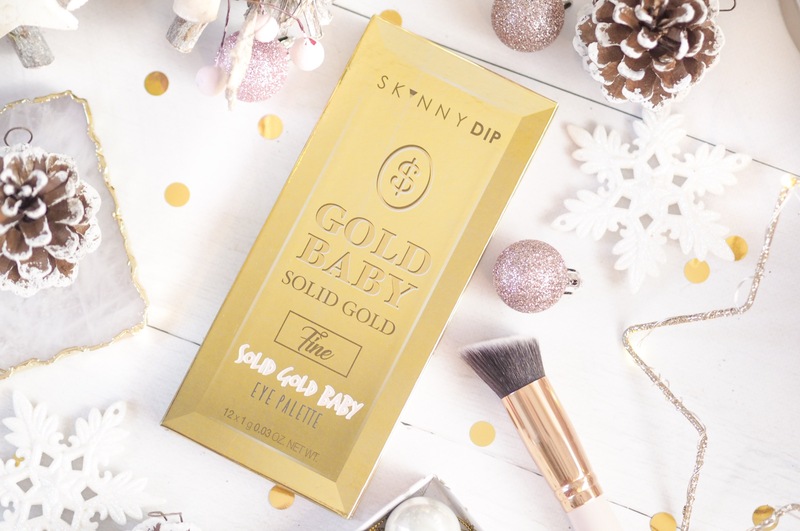 The other palette in their Christmas range is the Solid Gold Baby palette, which again is a very reasonable precept only £12.50. Plus for that you get 12 shades, which is amazing value! The shades again are all really wearable and have a lovely pigmentation. 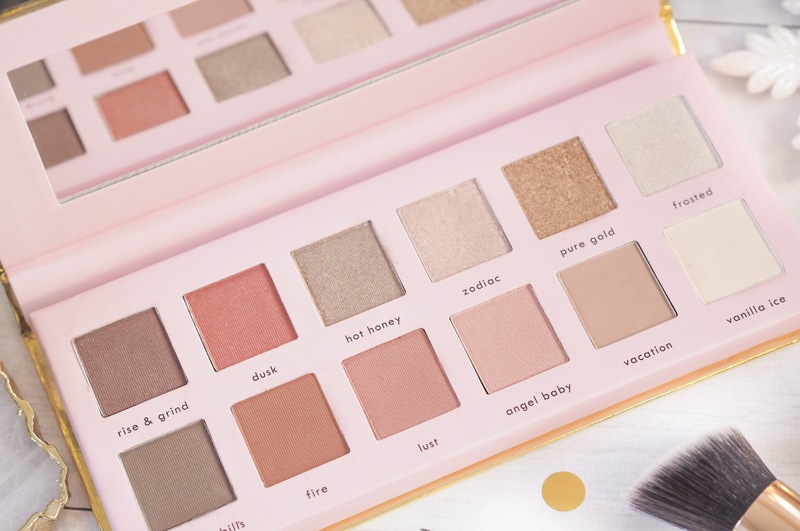 I loved that the palette had a mix of warm golds and burnt oranges but some pink tones too – so it’s a good palette to allow people to play around with looks. I think younger girls and newer make up lovers would love this because it’s going to give them so many everyday shades to work with! 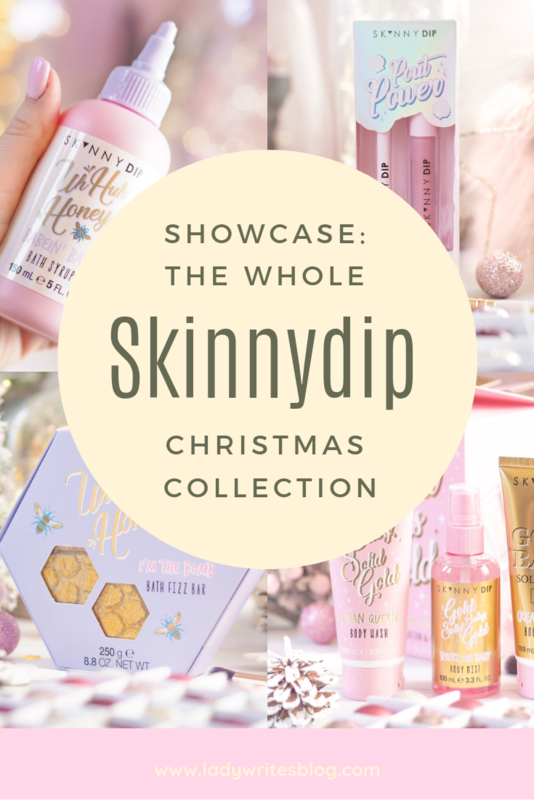 So that’s the whole Christmas Collection from Skinnydip and it’s an absolute beauty of a range, isn’t it? So pretty, cute and a great price point! What products stand out in this collection for you? These gifts are gorgeous. I love the three for two offers. That eyeshadow palette is so beautiful! All this packaging is gorgeous. I particularly love the shell hand washes! All the packaging on this brand is amazing! I love the milk carton of bubble bath! Love these photos!! They’re gorgeous! We stock this range at work so may treat myself with my discount! These look so pretty! I love the look of the bath bits! I love the look of the Bath Fizzers and Syrup! 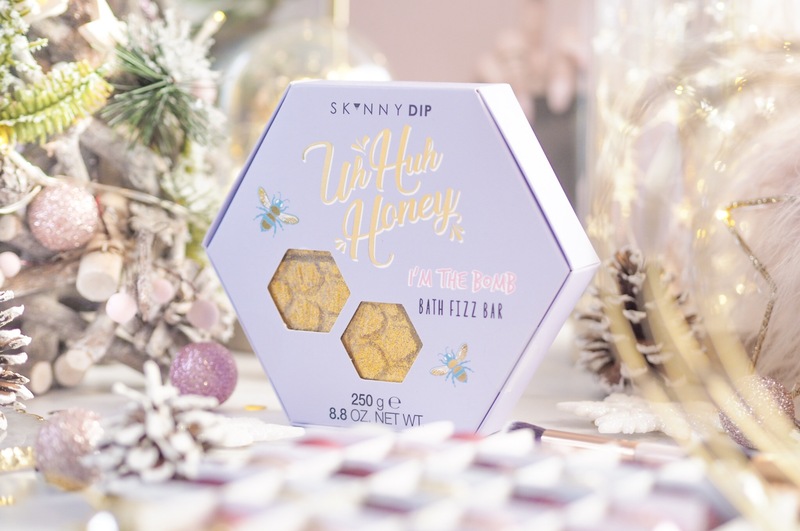 I adore the Skinny-dip brand! I always buy this for my cousin! 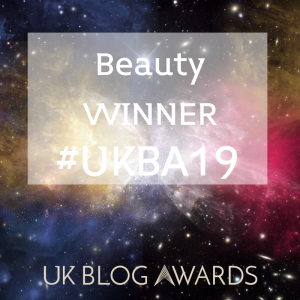 Ohhh I had no idea skinny dip did beauty! The packaging is soooo pretty!